What to do about Takapuna? Out of all the metropolitan centres proposed in the Auckland spatial plan (Albany, Takapuna, Westgate, Henderson, New Lynn, Newmarket, Sylvia Park, Botany, Manukau and Papakura), Newmarket and Takapuna really stand out as ones with huge potential for redevelopment to happen sooner rather than later. This is because, at least at first glance, they’re market attractive places for intensification. Newmarket’s almost a second city centre and has seen enormous apartment construction over the past decade – and has a lot of potential for further development to occur, while Takapuna has fantastic views, is pretty close to central Auckland and sits in the midst of the North Shore – which, by in large, is a place where people want to live and work. In the long-run, Takapuna could become something like Auckland’s version of North Sydney – a mini city centre all of its own. While it’s only 1.3 km from Takapuna to Akoranga Station – as the crow flies – land use patterns, the street network and the harbour make the actual walking distance close to twice this: and clearly outside what we can realistically expect people to do. Bizarrely, most of the prime land right next to Akoranga Station is empty fields and a golf driving range – perhaps one of Auckland’s poorest examples of land-use and transport integration. Most of the “future rail network” maps that we’ve come up with on this blog over the past week have proposed a kind of spur from Akoranga to service Takapuna. This is clearly shown in the network Matt came up with: As we’re learning with the Manukau Station, spurs have some frustrating geometric consequences. Because Manukau City is not “on the way” for south-to-north trips, even if we were to build a southern link (enabling trains from the south to head onto the Manukau branch) we would find ourselves with some annoying operating patterns. Do we run trips into the spur and out again, inconveniencing everyone who wants to travel ‘through’? Do we terminate trains from the south at Manukau, thereby creating a situation where we’re going to magically need more platforms to run decent frequencies? Do we just run a shuttle train back and forth linking Manukau with the main line? All are sub-optimal solutions. All result from it being on a spur. Theoretically we could put Takapuna “on the way”, if some future underground railway line following something like the alignment shown in green below: I’m just guessing that constructing this green line would be really expensive and/or incredibly technically challenging. Plus, we still don’t get around the issue of making the passengers take a pretty significant detour if they’re actually not travelling to or from Takapuna. If our Takapuna to city line is built as a Vancouver-style Light Metro, trains might be heading each way along it every couple of minutes – which combined with high frequencies along the Northern Busway mean that transfers are unlikely to be problematic. This arrangement provides really well for trips between Takapuna and the city and pretty well for both trips between the northern North Shore and the city (faster rail travel times would make up for any transfer time loss) as well as trips between the northern North Shore and Takapuna. You might eventually justify an extension to Milford, beyond that you’re deep into hilly suburbia with limited population and no obvious anchors till you get as far as Mairangi Bay or Browns Bay. It would be megabucks for small gains… but Milford is at the confluence of the two main roads of the East Coast Bays, so it could be the logical point to feed some quality bus corridors into rapid transit. A more practical solution could be a bus spur that comes off the northern bus-way just after Akoranga, runs alongside the Takapuna Landing, up Fred Thomas Drive before linking up to a two-way designated bus-lane heading down Anzac St into a bus terminal at Hurstmere Rd roundabout. Fred Thomas Drive and Anzac St are already wide four lane roads (for the most part) so you could loose the two central lanes and have a couple of mid-road bus stations along the way before the terminal at Hurstmere roundabout. Properly done, the bus lanes could then be converted to light rail along with the entire northern bus-way (if that day ever comes). Admittedly users would have to change at Britomart to continue further south and you’d still have a single limited capacity harbor bridge. There’s been on again off again discussion of Anzac ave bus lanes ever since the busway was built, that would do what you’ve suggested. Fred Thomas was built with full time bus lanes in mind, you’ll notice it’s particularly wide. There is a crap load of unused capacity at Akoranga, it does have four full platforms and only sees much use on two. Thanks Hank – sums up quite nicely what I was going to post (sorry to lazy for on that one 😛 ) in a nut shell. I like the last picture. That might work well until patronage on the busway finally demands that it be upgraded. I don’t think that Takapuna is such a nightmare. Given that we have four lines serving Auckland south of the harbour, why could we not have two (or more) serving the north? A Takapuna Line and a Northern Line going to Albany/Orewa. They’d share the tracks from Akoranga to Britomart/Aotea, but would then split. I don’t think that last sentence is as clear as it could be – but my general drift should be clear. One harbour crossing, two lines serving the Shore. I agree, a rail tunnel or bridge would have capacity for some twenty or thirty trains an hour each way. You’d do hard to justify that level of frequency on a single line, so why not have two or three sharing the tracks in the crossing and the city end? An interesting thing is if you look at that loop to put Takapuna “on the way” then it comes in at about 3.8km of track, probably all in tunnel. If you look at the branch from Akoranga it’s about 1.5km, or 3km return. So going from Smales Farm to Akoranga via a loop tunnel is about the same distance as going along the branch and back again. So in other words if you can turn around at Takapuna in the same time it takes to make a normal stop (i.e. as you can with automated light metro) then it’s actually just as fast to build a branch and send every train down and back on the way. Same trip time, same number of stations, same access, just one requires a long tunnel through tricky terrain and the other a short branch mostly at surface level. Personally, with the frequency and flexibility of light metro I wouldn’t run the main ‘North Shore’ line via Takapuna, but rather I’d make it the terminus of a second line headed across the harbour (say through to the Northwestern or something) and a second line headed up the Shore (say to the Upper Harbour corridor). Of course the elephant in the room when it comes to the question of whether you build North Shore rail as light-metro is what you do on the southern side. If you’re only going as far as Aotea then that’s fine – you have a really high capacity shuttle between Takapuna and Aotea with 2-3 stations between them. If you put in place the long term plans many of us are thinking about you get some serious problems/opportunities. Do you change the southern line between Penrose & Parnell to light-metro and build Airport Rail as Light-Metro (is there much freight demand on that section?) Or does North Shore forever remain a bit of an orphan from the rest of the network? A southeast line is a long, long way away. I would complete the airport route as heavy rail, it makes sense as an extension between the existing railheads at Onehunga and Manukau rather than an entirely new line. I’d say there is actually negligible freight demand but perhaps some opportunity for intercity trains access the airport as air feeders (or is that way to advanced thinking for this city?). That would give us four electric heavy rail lines to operate as two pairs through the CRL, in other words a nice complete and integral network. Beyond that I would pair the new North Shore line with a new line south of the harbour with similar design constraints, that is to say a line which doesn’t have an existing or obvious rail corridor to use so where the lax design geometry of light metro would come in handy. That might be the long lost southeast line, it might be a very similar line in the northwestern motorway corridor, or perhaps something like a Dominion Rd underground, although that’s fairly unrealistic. The first step would probably be just to Aotea via Wynyard, or perhaps a little further across town to a University station, and/or another connection point at Newmarket or Parnell or something. Sure that’s an orphan to start with (although one with extremely easy connections to the rest of the rapid/frequent transit system), and still less of an orphan than the NEX is. The second stage might actually be Manukau to Penrose or Tamaki via Botany and Highland Park. Again that’s a funny looking ‘orphan’ on the map, but it would still be an extremely effective addition to the rapid transit system with very frequent operation quick transfers to heavy rail and bus at either end. It’s certainly no worse than an AMETI busway that assumes most people will transfer at Penrose. The third stage would be to link the eastern and city sections, perhaps by skirting north or south around Stonefields above ground, in a trench through Waiatarua Reserve, then into a 5km long tunnel under the Remuera Rd ridgeline to the CBD. That’s still one hell of a big project but the easy geometry of light metro might make a relatively simple cut and cover tunnel just under the road surface possible. That would be the most effective line, but the much cheaper one would be the NW corridor using the motorway and CMJ to get right into the CBD. You could potentially route it around to Grafton Gully without any tunneling until you reached the University precinct. I don’t see much point in building new heavy rail lines just to carry suburban passengers, when there will be little opportunity or desire to run them through existing tracks (which will be busy providing fequent services of their own, plus carrying freight and intercity traffic) and where interconnectivity to the network should be occurring by transfer anyway. 2. As Nick suggests above under Wellesley St, through the CMJ and up the NW ROW as a conversion of the coming Busway for that alignment. However I can still see great interconnection value in the extension of the current Southern Line under Albert Park, through Aotea, the Harbour, and al least to Akoranga + Takapuna. I worked on the early days of the busway project and we recognised that it wasn’t well placed in the short term at least to leverage a land use response, with the exception of Smales Farm. So the team sat down and did a high level session looking at whether it could be relocated to better effect. All locations had drawbacks, topography, access and alighnment, but critically, if you moved the busway to the east it worked against people in the west and vice versa. The motorway alighnment was the least worst compromise, also the busway would sit within the motorway land corridor with minimal additional land acquisition costs. Green fields around the Akoranga station? It’s an old tip site, still settling and with stuff still coming to the surface. Some of the buildings on Fred Thomas Dr have gas detection gear in their basements to make sure that they don’t explode, but think of it as land banking. Akoranga deoes have an awkward relationship with Takapuna, we did have some discussion at officer level about extending Des Swann Drive and bridging the Shoal Bay inlet across to Byron Ave. A bus only (with peds and cyclists) bridge would allow buses to travel through the Takapuna bus station without doubling back. If they did that Steve (the bus-ped bridge) then the Takapuna CBD would eventually stretch all the way down across Barry’s Point to Akoranga. I agree about the land bank thing, huge potential there and actually quite a pleasant setting despite the motorway. The bus bridge sounds like a great idea and probably all that is needed for the forseeable future. Likely a 10-20 million dollar solution, as opposed to 9 figure rail solutions. I like the idea of a line running to Takapuna and on to Milford. I’m not sure what happened to it, but private plan change 34 was seeking residential towers to be built on top of the mall. The plans I saw had 2 towers, with something like 230 units (so 400+ people? ), plus other structures. If that got the go-ahead, then likely further higher-density development would occur in the area. Seems like that would make it worthy of the extension? A link like that would probably help encourage further development in the area, too. A lot of old fogies in Milford are fighting that scheme tooth and nail. They quite like living in their detached houses and seem to have their hearts set in forcing everyone in Auckland to live exactly the same way. Are there currently “express” buses to Takapuna? Using the Northern busway to Akoranga and then turning off to go direct to (say) The Strand without any stops after Akoranga? Don’t deviate it. It is simple to see what should happen. Use a shuttle service – either a busway so that all lines flow and terminate at one of the RTN stations or Light Rail if the capacity gets big. You can actually run BRT and LRT together if you want (See seattle). Short shuttle services can also be run at extreme frequency (every 2-5 minutes all day) for reasonable cost. I don’t see it as a deviation. The investment to get across the harbour will be enough for one project and there is capacity in the busway from Akoranga north for years to come, but a restriction from there south, so the best plan is to build a rail system from Aotea station through Wynyard to a transfer staion at Akoranga and on to Takapuna. Like the last image. Takapuna could become a fantastic and busy centre and so brilliantly connected in this way. Especially if the people have the courage to allow a real vertical village there. I think buses could flow off Hurstmere and Lake road, flow through Takapuna and then terminate at an RTN station. No need to build a rail spur or bend the rail line to fit through there. That was what I was getting at with the query about express buses. 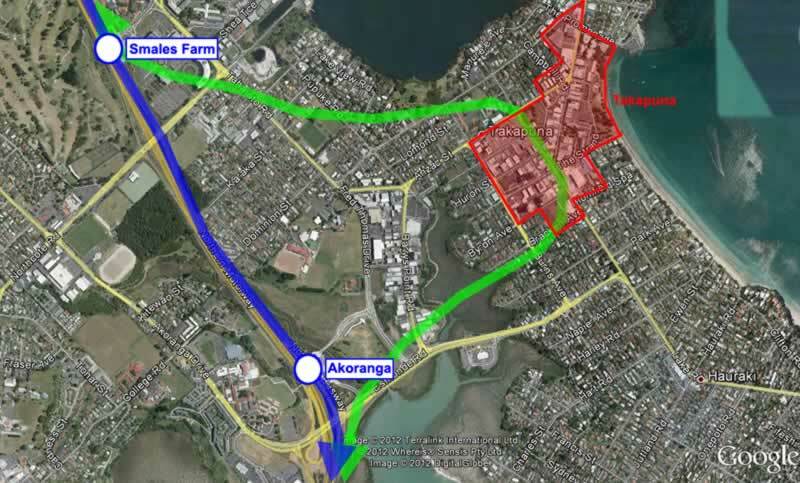 You could perhaps have one stop between Akoranga Station and the end point in Takapuna – to increase alk-up catchment – but that would be about it. An exppress bus from the CBD to Takapuna, making just two stops in between. All seems a bit obvious – they aren’t doing that now? LRT without overhead power would be the affordable rail option, running Aotea-Tank Farm-Onewa-Akoranga only. This would let it fit below a 3 lane road tunnel, or in a much smaller bore tunnel than those proposed for heavy rail. All other conections could be bus. Most of the distance form Onewa to Akoranga could be surface beside the motorway. It could extend halfway to Takapuna on the surface too although surely it would be more cost effective to run bus services. A frequent Ferry service perhaps? I know it’s been proposed in the past. I did some investigating a couple of years back of what would be required tunnel-wise to convert the busway to heavy rail, and established two tunnels north of Sunnynook would be required. Nice work, Geoff, if a little gold-plated. Supports the staging idea of first running to Takapuna and retaining the busway and interchange at Akoranga for quite a while yet. Or the value in Nick’s Light Metro which can largely run on the existing grades and curves of the Busway. An 18 hole golf course ocupies between 30 and 60 ha of land, acording to wikipedia. at any one time, on 18 holes, assuming an average par 4 per hole, with four people per group, a maximum of 288 people can be utilising this land. Are they really an efficient use of land? A quick count suggests that – in no order – Remuera, Chamberlain park, Akarana, Auckland Golf Culb(otahuhu), Titirangi, Maugankiekie could, at 45Ha each – release 270ha of prime central isthmus real estate. Now, in central auckland at present, non-repairable houses are being bought for $400,000 per unit, on – say – 400m2. This suggests the land value of alone is $1000/m2, and therefore 270ha -or 2.7 is worth up to $2.7 billion. Or, with 30 dwellngs per hectare, this would create 8100 houses, ; at 50, 13500; but this is still, realistically, greenfield development like Poundbury. A medium density development of 200 dph could create 54,000 dwellings. I would suggest that those trying to expand the MUL in fact investigate the under-utilised land that they take their balls for a walk of a Sunday. Wikipedia suggests that an average 18 hole golf course occupies between 30 and 60 ha of land. At any one time, assuming an average par 4 hole with foursomes, a maximum of 288 people can be utilising this land. Are this really an efficient use of inner city areas? A quick count suggests that – in no order – Remuera, Chamberlain Park, Akarana, Auckland Golf Club(otahuhu), Titirangi, Maugnakiekie could, at an average of 45Ha each – release 270ha of prime central isthmus real estate. At present in central Auckland, non-repairable leaky homes are being bought for $400,000. Assuming 400m2 per unit, this suggests the land value alone is beginning to approach $1000/m2. Therefore 270ha could be worth up to $2.7 billion. Or, with 30 dwellings per hectare, this would create 8100 houses; at 50dph, 13500; but this is still, realistically, greenfield development like Poundbury. A medium density development of 200 dph could create 54,000 dwellings. As far as parks go though, golf courses are fairly well utilised. Why not look at Cornwall Park, the Domain, Albert Park etc. If getting PT to the current CBD in Takapuna is to expensive, then surely the long term implication is that the free market will simply ensure the Takapuna business centre will shift to new locations nearer PT? Smales Farm is already an impressive office complex. The problem then becomes one of urban renewal. I would use Takapuna as a starting point for a new line to cross SH1 and head up to Glenfield road and then North to Upper Harbour eventually. Add Milford later if necessay. Interchange at Akoranga. Assuming a new harbour tunnel is going to be built anyhow, perhaps the tunnel route could be different and join the North Shore at bayswater rather than Northcote Point. Possible stations for a northshore line could then be: Britomart, Wynyard Qtr, Bayswater, Hauraki, Takapuna, Smales Farm and then join the busway route north. Peter, I like your second drawing, but it still involves either an expensive tunnel or ruining the fields of Rosmini High School. That places both options in jeopardy. Does a spur to Takapuna really need to pass through Akoranga? Why can’t a track go above ground along Esmonde Road a bit further and then above the mangroves inbetween Barry’s Point Rd and the houses on the other side (west of Burns Ave). Up to Como St and then tunnel/cut and cover under Como St until you get to the station underneath the big carpark next to the cinemas/over the road from Shore City. That block of land is crying out for redevelopment. Imagine being able to jump on a train at Aotea and be at Takapuna Beach in 5 minutes. It would revolutionise Takapuna. I agree with that Tom, but I think Peter’s maps are fairly indicative and broad level. By my reckoning a branch to Takapuna could be contained within a narrow sliver of the reserve along Takapuna Landing and not go anywhere near the playing fields. As for passing through Akoranga, I think that is absolutely essential as a connection point. Without it the only way to get to the Takapuna line would be to go all the way to Aotea, which is a little silly if you’re coming from the Shore! It also means you couldn’t go anywhere from Takapuna except the CBD, for example using the line to get between AUTs Akoranga campus and Takapuna central would probably be very popular, but impossible unless the train stops there. Yeah. You are right about Akoranga. It is neccessary for there to be a stop at Akoranga. Its positioning is just so awkward though. It annoys me. As for the next stop being Aotea – would there not be a stop under Wynyard Quarter as well? And what are your thoughts on a stop at Onewa? Would that be feasible? Unfortunately (like Akoranga) the only spot to build a station is a considerable distance from the catchment area it would aim to serve. And of course would slow down the trip into the city. Surely all the grass around Akoranga means that it could become a really high intensity transit oriented development in the longer term, once the landfill has settled properly? Please, not another spur like Manukau – not even with a chord both ways. A through line has nice simple capacity – follow the train ahead at headway and get (say) a practical 16 tph – a train every four minutes or whatever slower frequency is required. Put in a spur instead and instead of nice simple headways you add flat junction conflict and margins, platform end conflict and margins, driver change end time, platform end conflict and margins and flat junction margins, and suddenly the need to make the spur work in a reasonably efficient manner starts to drive the whole of the rest of the timetable. Even better, have the service go from the Takapuna spur to the Airport spur and see all sorts of inefficiency turn up! Can we run a sweep on how long it is before the Manukau branch has to be doubled throughout in order to get unit efficiencies or to allow a step change in frequency to happen? Staged doubling of Manukau was always part of the plan. They can’t get much more than the current 3tph with the single track, but it’s not a huge job to double the junction. Lots of options to choose from but my favorite example is below. Unless a short spur is on a line at a point where it is desirable to reduce the frequency I feel spurs are operationally difficult. I doubt that Takapuna and Akoranga could generate enough patronage to justify a really frequent service, but I think a line running the length of the north shore with a high quality link to Takapuna could justify it. – hence better service for the entire north shore. ok, my html code didn’t work. Here is a simple link. How about a moving walkway, overhead, between Lake Rd and Akoranga?